Heat a non stick frying pan over low heat. Add the duck breasts, increasing the heat as the duck cooks. Cook until duck skin is golden brown and middle is still slightly pink. Remove from pan. Soak the noodles in a bowl of boiling water until soft then drain and run under cold water. Transfer the noodles to a bowl and toss with capsicum, green onions and herbs. Combine the fish sauce, lime juice, oil and sweet chilli. Toss with the noodle mixture and fold through sliced mango. 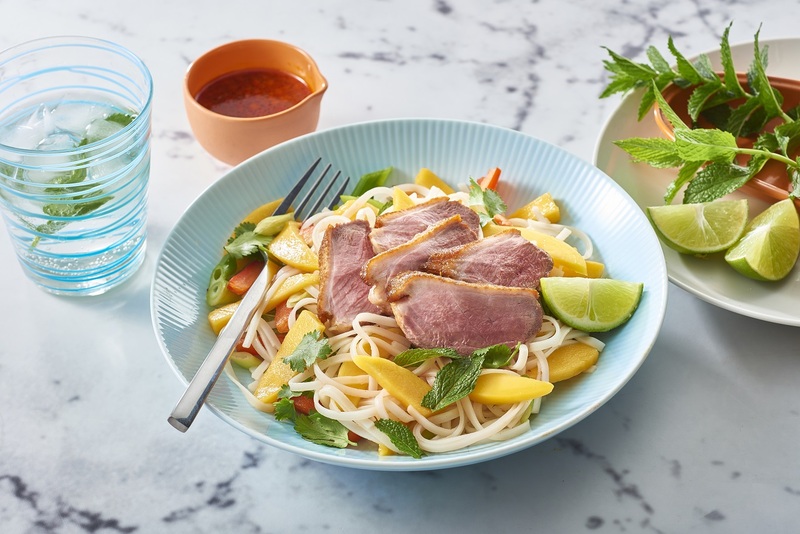 Slice duck breasts and serve with mango noodle salad. Serve with lime wedges. Tip: It’s best to cook duck breasts starting them in a cool pan.